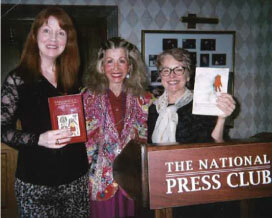 L-R Past Louisiana Poet Laureate Julie Kane, Janice Law and current Poet Laureate Ava Haymon speak at AWWNM event co-sponsored by Louisiana State Library and Louisiana Center for the book. SOUTH DAKOTA VISIT L-R Jennifer Widman, Director of the South Dakota Center for the Book, Sherry Deboer, Executive Director of the South Dakota Humanities Council (standing), and Janice Law (right) visit in Brookings, SD about SD women writers. 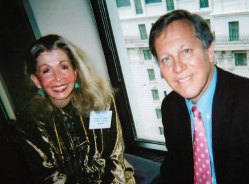 Janice Law, AWWNM Founder, discusses American Women Writers with poet Dana Gioia, who spoke in March 2013 when AWWNM honored California women writers as part of the 50-state Project. 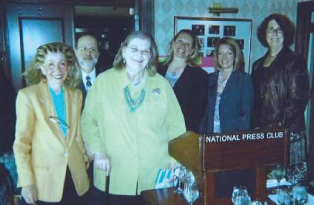 FOIA WOMEN Experts on Freedom of Information Act, at AWWNM’s April 17 event. 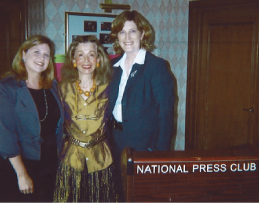 L-R - Angela Canterbury, Project on Government Oversight (POGO), Janice Law (AWWNM Founder), and attorney Lucy Dalglish, Dean of Merrill School of Journalism at University of Maryland. Click here for video with 50-state Project excerpts from women writers in D.C., Florida, Georgia and Hawaii. LOUISIANA POETS Respond to Audience Questions. AWWNM visits MONTANA Center for the Book – Samantha Dwyer, (right) program assistant, and Janice Law hold AWWNM flyers. Law visited the Montana Humanities offices in Missoula. 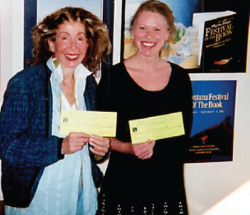 To print a free poster featuring Montana women writers, Click HERE. WILLA CATHER SCHOLARS participated in readings for 50-state March 2013 State Program honoring women writers from California, Colorado, Connecticut & Delaware. 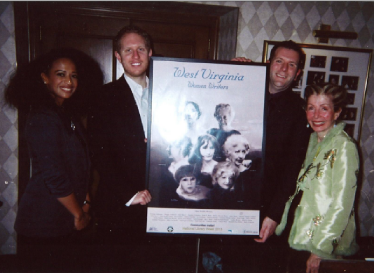 WEST VIRGINIA STARS - -- L-R: Oprah Winfrey featured poet Rachel Griffiths read from book of West Virginia Poet Laureate Irene McKinney, Jamie Bosley of West Virginia State Society read from novelist Denise Giardina, Chris Greaver, President of the West Virginia State Society in DC read work of Nobel Laureate Pearl Buck, and Janice Law, AWWNM Founder, moderated. 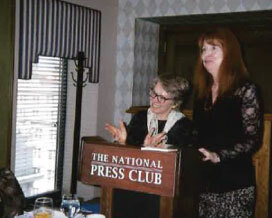 Music of Hazel Dickens was played January 29, 2013, at co-sponsored event with AWWNM and West Virginia Center for the Book at National Press Club. To See Jan 29, 2013 Video, Click on link at left. Thank you for the great program on Oklahoma Women Writers and for your generous hospitality! I appreciate your very kind introduction. Rilla Askew presented such a meaningful message which really connected with us Oklahomans. I often gage the success of Oklahoma events in DC by if they make you feel like you are in Oklahoma again. This was a wonderful success! Your comments also were so professional and the AWWNM program had such depth and professional structure. I was very taken with the program and really look forward to attending future AWWNM programs. 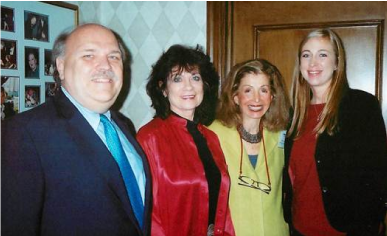 AWWNM and Oklahoma CFB program Nov. 14 - -- L-R: Larry Guthrie, writer Rilla Askew, AWWNM founder Janice Law, Oklahoma State Society President Tabitha Layman. 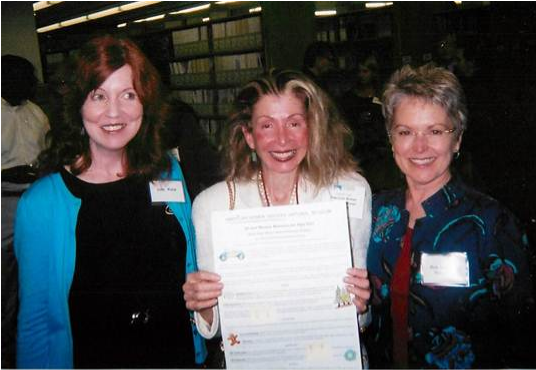 50-state Honorees L-R -- Julie Kane, Louisiana 2012 Poet Laureate, Janice Law, Poet Ava Leavell Haymon, autograph their Louisiana listing on AWWNM’s May 2012 Honoree List Poster. 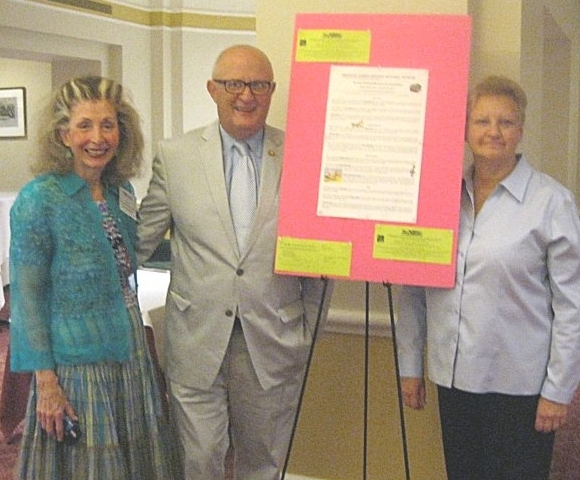 LITERARY NEW YORK & AWWNM - L-R: Janice Law, AWWNM founder; Rocco Staino, chair, Empire State CFB, and Bev Frey, president New York State Society of D.C., pause near AWWNM's 50-state poster at their September jointly-sponsored 50-state Project event at the Army-Navy Club. 50-state Project Launched in May, 2012. Look on the 50-state Project list (below) of the American Women Writers National Museum-- to see in what month women writers from your native, adopted, or favorite state will be showcased at National Press Club, 529 14th St NW, Washington, D.C. 20045. 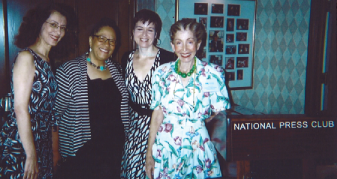 Also, below, read ways you can participate even if you can't visit D.C.
AWWNM's exciting 50- state project is offering CFB affiliates a creative opportunty to program a portion of an assigned month in D.C.at AWWNM, to laud the brilliant work of premier American women writers of that state. Four states are assigned alphabetically to each month to present in D.C.-- programs during any week of that month, individually or as a four-state group. To facilitate rotation, so no state is permanently "stuck" with a month they don't like, your state's talented women writers can shine for a month nationally every 13 months. Sending AWWNM, any posters, brochures, or other printed materials from your state. 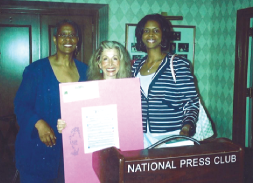 Contacting media in your state, or D.C. bureaus thereof, to publicize AWWNM events. Suggesting a reception, reading or other event at AWWNM individually, or with the other three states, during your month. Emailing, tweeting, phoning D.C.- area friends, organizations, legislators and Congress members, inviting them to stop by AWWNM or send a rep during the month AWWNM features your state. AWWNM's 50 state enterprise is new. As with any debut idea, we will begin small with baby steps, and there will be kinks to be resolved. AWWNM hopes 50-state will grow and improve each year. Although AWWNM is a CFB reading partner, the 50- state blueprint is solely AWWNM's creative brainstorm!